Once again The Flea Theater announces the program of its dance festival entitled Dance Conversations 2012 which runs from March 14 – 25. 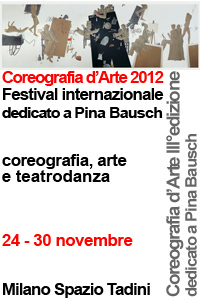 The Festival is free and hosts films and works-in-progress by 36 emerging and established choreographers. Curated by Nina Winthrop and Taimi Strehlow the festival will start with an evening dedicated to the screening of six dance films. In the consecutive seven evenings of the festival four performances will be showed each night followed by a discussion between performers and audience moderated by an invited choreographer. The artists presented will include returning and new choreographers at the Festival such as: Katie Balton Dance, Claire Porter/PORTABLES, Amos Pinhasi, Leyya Mona Tawil and Lars J. Brouwer, Barbara Mahler, Columbine Macher, Athena Kokoronis, Daniela Hoff Dance Company, Mare Hieronimus and Sharon Mansur, Donna Costello, Catey Ott Dance Collective, Inclined Dance Project, Jessica Ray, Movement of the People Dance Company, Vangeline, Megan Sipe, Molissa Fenley, Maggie Bennett, Caliince Dance, binbinFactory, Talya Epstein, David Appel, Beau Hancock, A.H. Dance Company, Peggy and Murray Schwartz, Luke Murphy, BARKIN/SELISSENPROJECT, Daniel Gwirtzman Dance Company. Films: Life In Security by Keith Johnson & Gregory R.R. Crosby; Emergences by Shantala Pèpe; Surgeon General’s Warning by Natalie Metzger; Brothers Keeper by Marta Renzi; Tree by Pyeunghun Baik; Nobody’s Darling by Marta Renzi; Seven Fruits by Pyeunghun Baik. While the group of moderators includes Wally Cardona, John Jasperse, Pele Bauch, Gina Gibney, Carol Ostrow and Jonah Bokaer. Dance Conversations challenges the spectator in a unique way. The spectator here cannot stay passive and comfortable in the darkness of his chair amongst the big audience. Here, audience members are invited to be part of the creative process. Facing the fact of seeing a work-in-progress, an unfinished piece that he/she will have to imagine in its final form, challenges the spectator. At the same time audience members are invited to think about questions, themes, feelings while watching the piece something that they will later elaborate in the conversation to follow. As such Dance Conversations becomes an interesting and hopefully changing experience for the spectator who is now invited to watch dance in a more active, critical, engaging and probably imaginary way. Nina Winthrop (Dance Conversations Curator) formed her company, Nina Winthrop and Dancers, in 1991. Her works have been presented in venues throughout New York City and Los Angeles, including Danspace Project, Joyce SoHo, Brooklyn Academy Of Music, Movement Research at the Judson Church, Mabou Mines’ Toronada Theater at PS 122, Roulette and The Flea Theater. Her dance films have been screened in the US and abroad. Nina was awarded a Bessie Schönberg Choreographers’ Residency at The Yard in 2004, a Dancenow/NYC’s Silo Artist Residency in 2005, and participated in the Schönberg Choreographers Lab at DTW in 2005. She is on the Board of Directors of New Dance Alliance and Danspace Project. A graduate of Bennington College, Nina danced with Wendy Perron, Susan Rethorst, Yoshiko Chuma, Sally Silvers and Kei Takei, with whom she toured the USA and Japan, and studied with Erick Hawkins, Merce Cunningham and Deborah Hay. Taimi Strehlow (Assistant Dance Conversations Curator) is a Program Administrator for the International Peace Institute. 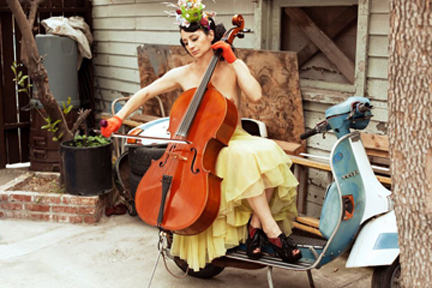 Before entering the dance world, she was a television producer with A&E, The History Channel and PBS. Her film, Big Known Names received the best documentary prize at the 2007 Red Bank International Film Festival. Taimi holds degrees from Dartmouth College, New York University and CUNY/Zicklin School of Business. The Flea Theater, under Artistic Director Jim Simpson and Producing Director Carol Ostrow, is one of New York’s leading off-off-Broadway companies. Winner of a Special Drama Desk Award for outstanding achievement, Obie Awards and an Otto for political theater, The Flea has presented over 100 plays and numerous dance and live music performances since its inception in 1996. Past productions include the premieres of Anne Nelson’s The Guys; six plays by A.R. Gurney (Post Mortem, O Jerusalem, Screenplay, Mrs. Farnsworth, A Light Lunch and Office Hours); Mac Wellman’s Cellophane and Two September; Roger Rosenblatt’s Ashley Montana Goes Ashore… and The Oldsmobiles; Elizabeth Swados’ JABU and Kaspar Hauser; Karen Finley’s Return of the Chocolate Smeared Woman; Adam Rapp’s Bingo with the Indians; Will Eno’s Oh, The Humanity and other exclamations; Dawn by Thomas Bradshaw; The Great Recession, Jonathan Reynolds’ Girls in Trouble, Bathsheba Doran’s Parents’ Evening, and most recently the holiday hit Looking at Christmas by Steven Banks. 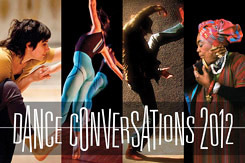 For more information on this year’s Dance Conversations and artists, visit www.theflea.org. The Flea is located at 41 White Street between Church and Broadway, three blocks south of Canal Street in TriBeCa, close to the N/R/Q/W, 6, J/M/Z, A/C/E at Canal, or the 1 train at Franklin.